The conduct and agenda of much of the Australian media, with respect to Schapelle Corby, is documented in a number of Expendable reports. In particular: The Primary Smear Report, The Prison Abuse Report, and The Opinion Management Report. Regrettably, smears, fabrication, outright lies, and censorship, are self-evident all too often. In this Insider Interview, Col Chapman describes and discusses a number of extremely disturbing methods and approaches. He covers home bugging, phone hacking, GPS vehicle tracking, and even hidden surveillance cameras placed inside Kerobokan prison. He affirms that, even the most contemptuous of approaches, failed to link Schapelle Corby, or her family, with drug syndication. This, of course, reflects exactly the same findings by the police. Mr. Chapman is a hugely experienced private investigator, and has worked with most of Australia’s mainstream media organs. He was employed intensively, and long term, on the Schapelle Corby case, and is able to provide what is probably the most authoritative insight into media activity and behaviour, with respect to this case. Unfortunately, this was to no avail. Little interest was shown, and he was offered no protection or substantive assistance. Mr Chapman also approached a number of other related parties, with similar results. Equally alarming, supporters of Schapelle Corby, and those perceived to be associated with The Expendable Project in Australia, were simultaneously subjected to legal and other threats, stemming from a variety of sources. This was despite them having no editorial capacity whatsoever, and no link to the publication unit in the United States. The Expendable Project considers a number of these to have been vexatious, and crude attempts to intimidate the project itself, via threats to clearly innocent citizens. 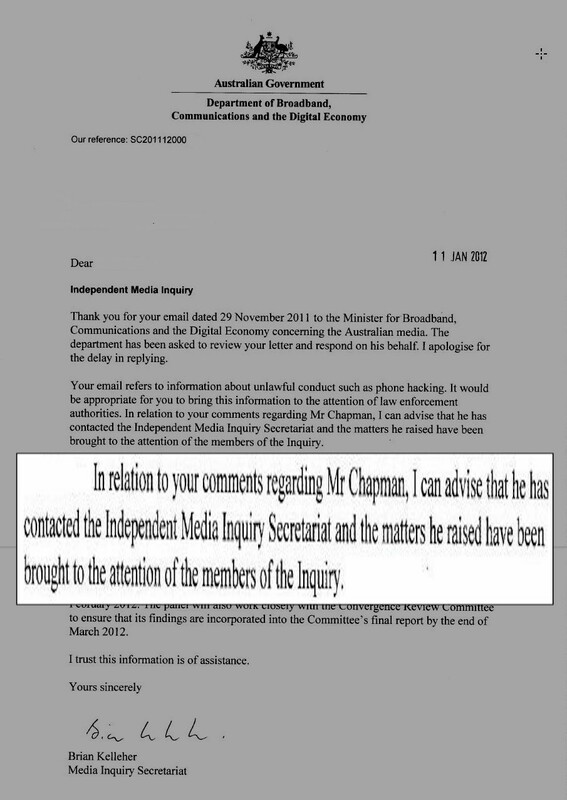 Mr Chapman, himself aware of this sequence of events, subsequently sought to retract his statements. However, The Expendable Project obtained additional correspondence, demonstrating that he had also been approached by a third party. Indeed, The Expendable Project holds a number of other materials regarding approaches to Mr Chapman. Given all these circumstances, The Expendable Project does not consider Mr Chapman's response to be without at least an element of duress. LEGAL NOTICE: In the following recordings, the names of a number of parties, including individuals acting in a representative capacity, have been omitted. These will be submitted to appropriate third party entities in due course (including international institutions), and are thus being managed as sub-judice for the present time. If the videos below have been censored in your location, they can be viewed via another stream (currently Chinese) from this alternative web page. Additional third party interviews will be published shortly.